Please join us as we celebrate the 20th anniversary of New Jersey's Abbott preschool program, a national and international model of high-quality and effective preschool education. 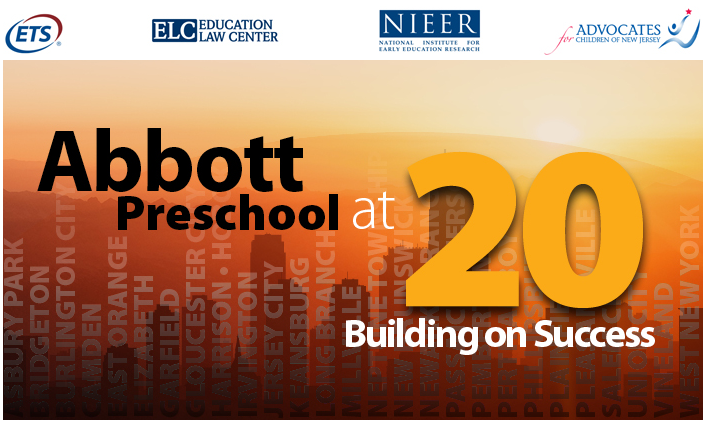 "Abbott Preschool at 20: Celebrating Success" is a unique one-day conference featuring state and national experts who will discuss the challenges and opportunities involved in program creation and implementation, as well as the best practices at the core of the Abbott preschool program. They will also discuss the feasibility of expanding this high-quality model throughout New Jersey, in other states and across the world. Register now to attend this free conference. Your support makes this work possible. Thank you! Consider making a donation today.